Redesign a scalable business dashboard to display complex subscriber data from disparate databases and industries in a unified, modular design. Redesign a web-based business platform that presents industry data flexibly for subscription levels and user customization enabling IHS, a data company, to provide a consistent experience to subscribers across industry sectors by scaling for different business lines. Assess databases for Energy sector, conduct stakeholder interviews and work with the project sponsor and in-house user experience teams to deliver wireframes and designs for the business dashboard. Breaking the project into functional sections, drafting briefs and requirements alongside the projects director enabled the team to craft a shared vision to work towards as well as divide and conquer tasks. Guiding the vision for the Connect redesign, our user experience director conducted stakeholder interviews to establish business and user needs. Based on the direction for the interviews, I identified challenges spanning the themes of visual design, navigation, content relevancy, and user migration from legacy platforms. I worked with our team and the client stakeholders to position Connect on a spectrum between workspace and editorial platform. This spectrum became a point of validation and our "north star" leading to relevant user models and patterns. Noting that the platform would integrate multiple types data for different audiences and that user familiarity would be critical to adoption of tools we knew narrative was critical. To address the issue of text-heavy content and limited imagery we drew inspiration from familiar news patterns for information architecture, but treated modules with tool-like features (e.g. settings) to allow users to learn through exploration in addition to the training provided by IHS. Collaborating with our directors of user experience and projects, I was responsible for leading the editorial and saved content sections developing user journeys and wireframes for those sections. 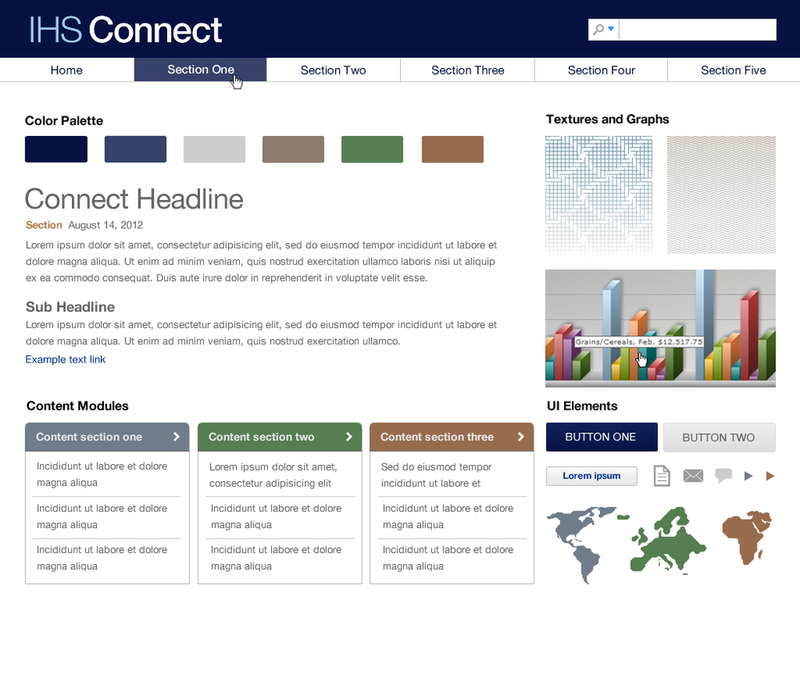 I also contributed to the editorial approach to the homepage and application-focus of the dashboard. We used fluid design principles to allow modules the greatest amount of flexibility across the entire platform. Our experience working across multiple IHS products enabled us to continue to build on an established visual style. I worked with our design team to refine the visual design for consistency across products and sections of the application. 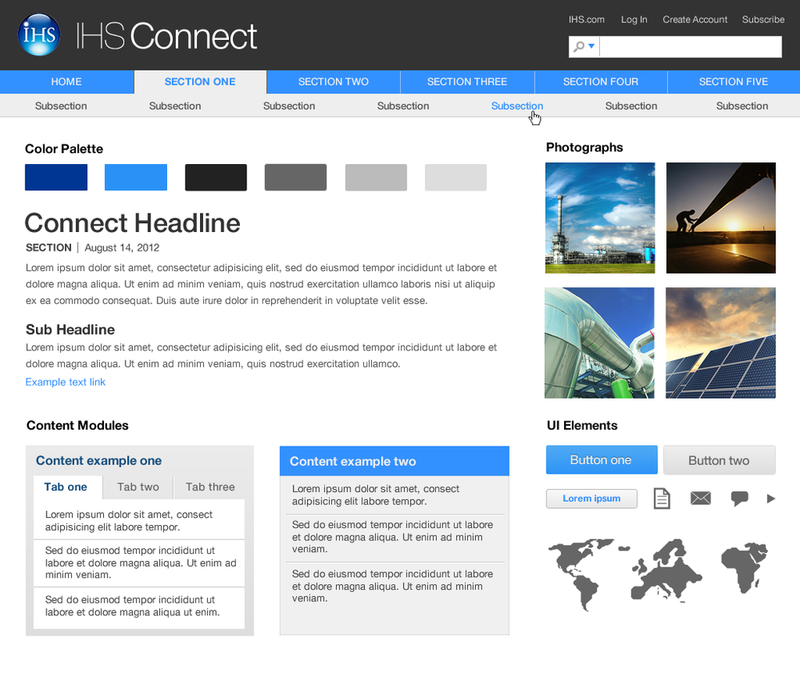 Additional assets and deliverables from the project included style tiles and data types at multiple scales. We designed modules at different scales to fit the flexible framework. On the smaller scales we used controls to introduce progressive disclosure of information, while supporting a scan-ready version for high-level information. We also created alternate visual treatments for static vs. interactive modules. At the conclusion of our contract the internal user experience team absorbed the project to adapt and deliver in 2013. 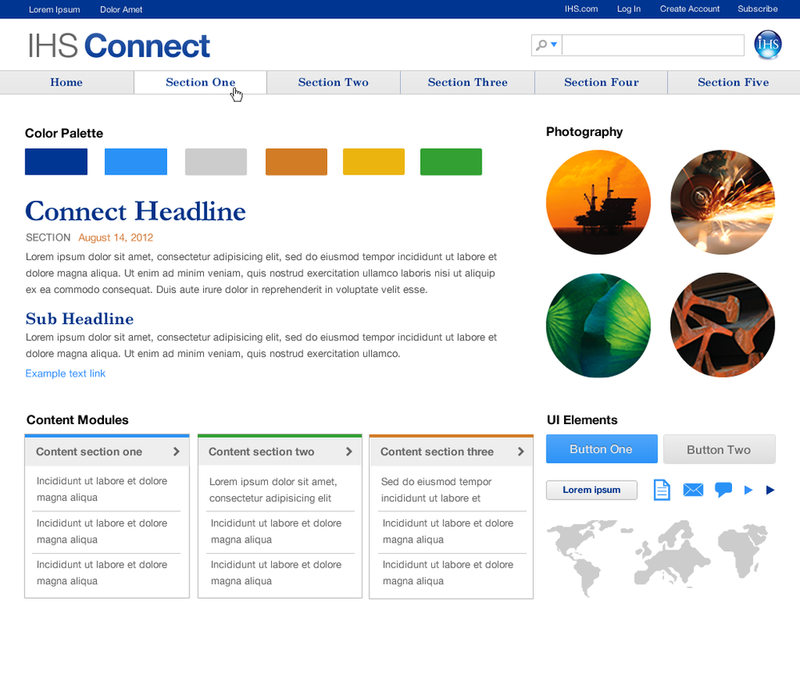 IHS has since expanded the Connect application beyond desktop. Applications can be accessed from the IHS website.